My favorite herbal remedy is fenugreek tea for a flu with stomach issues. You can buy fenugreek at any Indian or Arab market in your town or online – it looks like little yellow rocks. The kids LOVE the taste. You simmer it for 20 minutes on a low heat (1 tsp. Herb per 1 cup of water) and then when you serve it to the kids add some honey and some milk of any kind (rice, soy, organic, etc..). It tastes delicious and it brings down a fever very gently, soothes the stomach and provides a lot of nutrition and balances blood sugar too. For colds or flus with trouble breathing you can make tea from thyme leaves. It tastes delicious and it releases all that phlegm and opens up the lungs so quickly! For adults it is one cup twice a day. For 12 year olds a half cup and 6 year olds a 1/4 cup and 3 years olds 1/8 cup, etc….you just keep dividing in half. 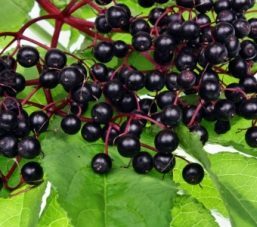 My favorite remedy for colds with runny nose is elderberry tea. It tastes like juice if you don’t simmer it too long and if you put enough honey in it (or stevia). A lot of people mix this with peppermint and yarrow for the best effect but I find that that is too much “taste” for little ones usually. I usually make a syrup from it every winter and then when the kids are sick I give them a spoon or two. It is delicious! It also brings down the fever and stops a runny nose like a miracle. I’m not even tempted to try cold medicine after using this syrup. 3. Bring herbs to a boil, then simmer for about 1 hour until volume is reduced by 1/3 and the water now measures about 500ml (you can approximate this and add more water later to bring it up to 500ml if you have to). 4. Strain herbs out through a muslin cloth to be able to squeeze all the juice out of them. Add 125ml (1/2 cup) of honey or vegetable glycerine**and heat and stir together until honey is dissolved (5 minutes). Cool and store in a glass corked bottle in the refrigerator up to 3 months. Dose for adults is 2 TBS. 3 times a day. For children: 1-2 Tsp. 3 times a day (see hcp). **vegetable glycerine can be found at pharmacies. Make sure it is the quality for consumption. This is a little better than honey to use so try to find some if you can. Although honey still is effective.